It’s that time of the year when I am scratching my head to figure out new flavours and food items to pack in Nabeel’s lunch box. I know it’s been only a month since school re-opened yet the regular Tiffin making activity has already started to get boring for me. 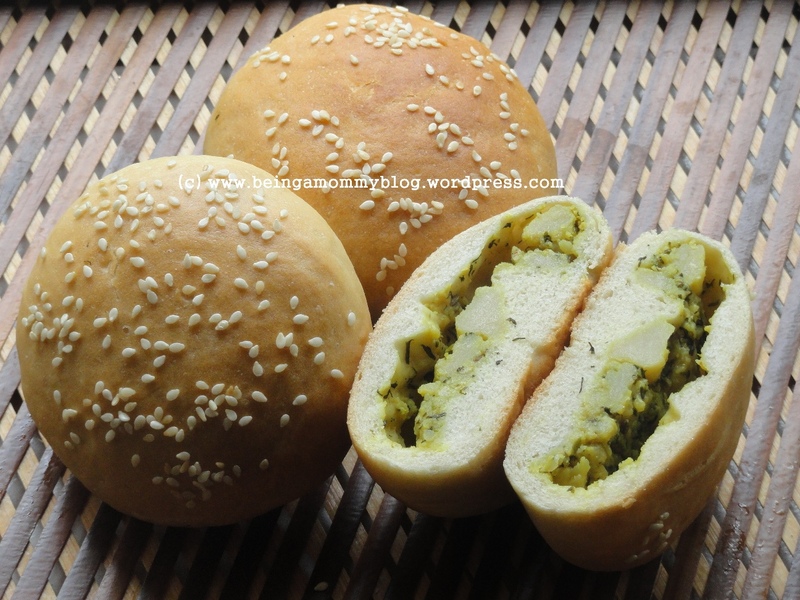 So recently, during one of my blog-hop session when I came across this cool lunch box recipe for kids – Spiced Potato Stuffed Sesame Buns, I jumped to try it the very next day. And boy, it was magical! 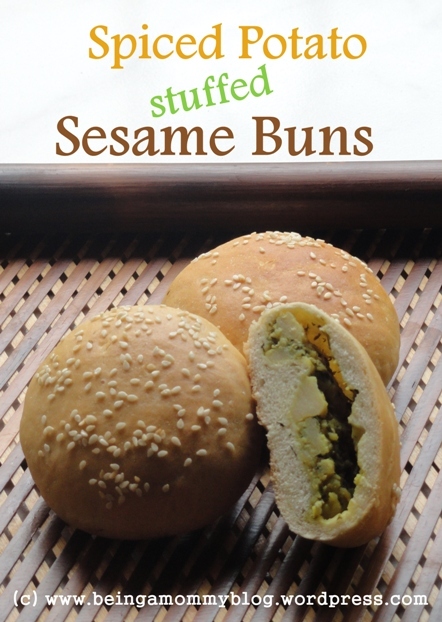 Prepared with very basic everyday ingredients available in our kitchen these stuffed buns are a great option for kids as a snack, picnic food and for school lunchboxes too. Do give them a try, they just look fancy but are easy to make. They are best baked fresh in the mornings. Cool them and wrap with cling film and pack in the Tiffin, the freshness will remain intact. Once you have mastered the bun part then the stuffing options are unlimited from chicken to mince to mixed vegetables..just create what you enjoy. Step 1 – Start by preparing the stuffing, mix all the ingredients in a bowl. Check for salt, cover and keep aside. Step 3 – In a bowl, add flour, salt and the yeast mixture. Mix and knead everything well to form soft pliable dough. Use some more water, if required. Step 4 – Add the oil and knead well. Cover the dough with a damp muslin cloth and keep in a warm part of the kitchen counter for the dough to rise (ferment). This should take approx 20minutes. 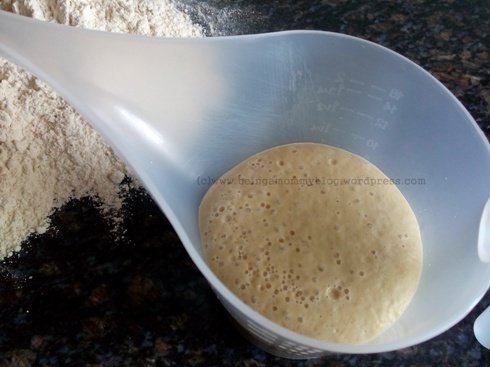 After fermentation, the dough will double in size and will be spongy to touch. Step 5 – Dust a clean and dry section of the kitchen counter with some flour and punch the fermented dough on it. Literally, punch to remove all the air and flatten the dough to its original size and texture. Step 6 – Dived the dough into 4 parts, make smooth round balls and leave again to ferment for 10 minutes. Step 7 – Repeat step 5 for each ball. Step 8 – Take each ball and stuff it with some potato filling. Make balls again and place on a greased baking tray. 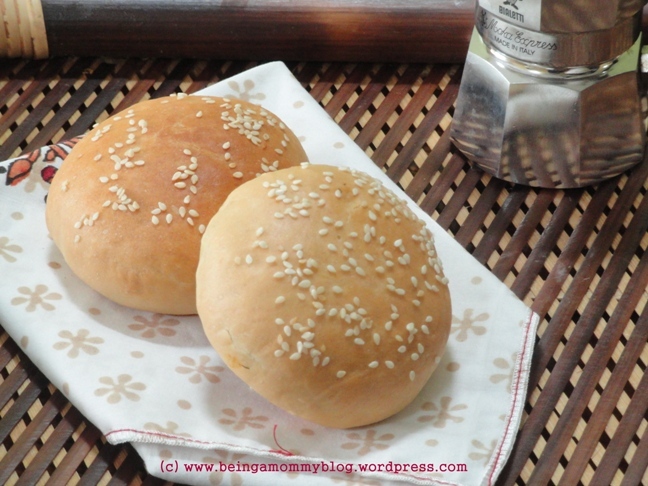 Step 9 – Brush each bun with some milk or egg yolk, sprinkle with sesame seeds (press them lightly to stick) and let the dough rise for 10 minutes before baking them in a pre-heated oven for 25 minutes at 200C. Step 10 – Once out of the oven, brush the buns lightly with melted fat. Notes: The buns, ideally, should be consumed the same day. If needed, refrigerate them and consume within 2 days. Buns can also be frozen for a week and re-heated in an oven.